This page is for the original release. For the emulated re-release, see Ecco the Dolphin (2010). 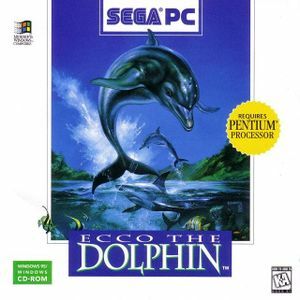 Features improved graphics over other versions, redbook audio soundtrack from the Sega CD version, FMV sequences from Ecco the Dolphin: Tides of Time, new levels, selectable difficulty settings, and a save feature. Runs badly on newer systems. A fan port for modern Windows operating systems exists. This version is not available digitally. An easy-to-use launcher GUI to change settings for the game. Compatibility for 32-bit and 64-bit versions of Windows Vista, 7, 8, 8.1, and 10. Music playback for the game from audio files (MP3, WAV, OGG, and more). Fully portability; removes CD check and all save and configuration files are stored under <path-to-game>. Launch the game using either Ecco PC Launcher.exe (opens settings) or Ecco PC Launcher (No GUI).exe (jumps straight into the game window). Game path must not exceed 128 characters. Fixed and Enhanced Edition changes this location to <path-to-game>. 320x240 and 640x480 only. Nearest neighbor scaling is used in Fixed and Enhanced Edition for fullscreen. Requires Fixed and Enhanced Edition. Controller buttons are referred as Button 1-4 in configuration menu. Fixed and Enhanced Edition only has a Music volume slider. The entire game is text-based. Only 16 and 32-bit executable are used for this game. This page was last edited on 2 September 2018, at 10:22.